HANFORD, CA- Late last week, Justin Mendes received the endorsement of the Kern County Farm Bureau. On Tuesday, he was officially endorsed by the Kings County Farm Bureau, successfully earning endorsements from both Farm Bureaus in his district. Mendes, a valley native, was raised on a dairy farm. Staying true to his roots, he has remained a strong, reliable advocate for Central Valley agriculture. “Support from the Kings County Farm Bureau and Kern County Farm Bureau is a reminder that ag is a family that stands together. 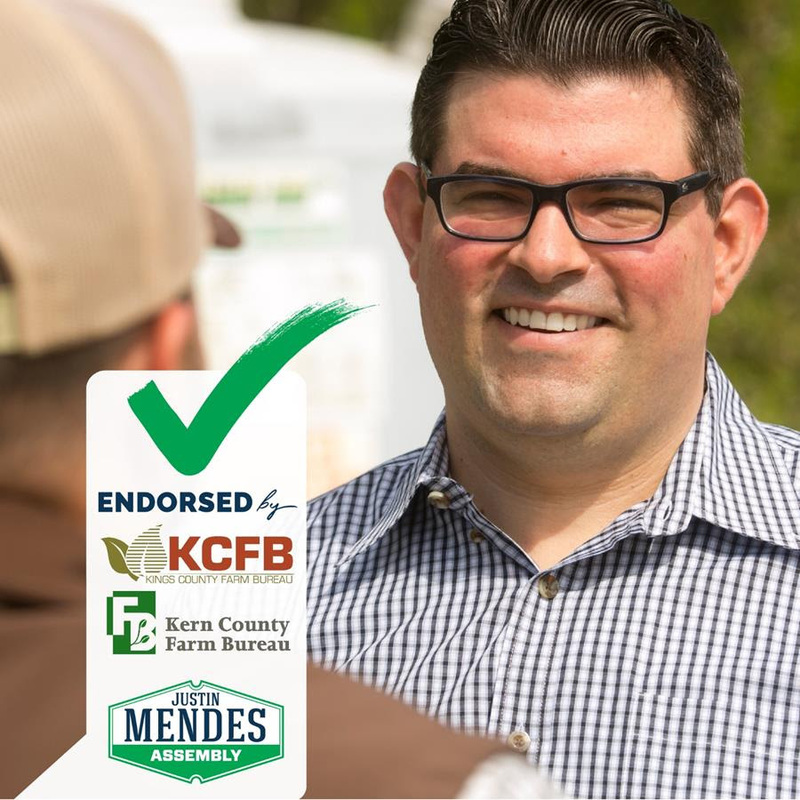 I am proud to earn their endorsement, but more importantly, I am proud to represent hard working farmers, ranchers and dairymen across the Central Valley,” said Mendes when announcing the endorsements. Following his election to the Hanford City Council in 2014, Justin Mendes focused on improving public safety in his community. He has lead the fight for a new fire station and increased the police presence in local neighborhoods. Justin Mendes is a Hanford City Councilman, a husband and a father. On the Hanford Council, Justin delivered clean water to his constituents and put his residents above political agendas. He has continually fought to create new jobs that will benefit the community for the long term.